This is my story of my exploration of this issue over the past two years. Before I got pregnant, I was moderately ill with M.E. This meant that I only had enough energy to work 2 hours a day (10 hours per week) and my mobility was limited to 200 metres per day. I was a wheelchair user and spent my afternoons in bed sleeping. When I got pregnant, I was overjoyed and excited, but also fearful for what this would mean for my illness, because sleep deprivation and physical exertion make M.E. worse. Having a baby meant labour (major physical overexertion) and then months of broken sleep. Even healthy people struggled with the physical demands of having a baby – how would I cope? One of the difficult decisions we had to make was whether to go through labour or have an elective Caesarean Section. My concern wasn’t the pain of labour but the exertion required to push a baby out. How could I spend an hour pushing when I didn’t have the strength to walk to the end of the road? I was trying to balance the risks of surgery with the risks of a major relapse (worsening of symptoms) if I went through labour. We didn’t have a lot of guidance from doctors, because there is so little research done in this area. They didn’t know what to advise. The first doctor we spoke to refused to consider a C-Section, saying, ‘Labour is not fatiguing – the uterus does all the work for you.’ (I would have liked to have seen her say that to a woman who had just given birth!) In the end we went for a compromise, of sorts: we decided to try for a labour birth, but to have an epidural as soon as possible, and if the labour was too long or if I were getting too tired then they could do an emergency C-Section. When we talked about our fears to other Christians, the overwhelming message we had was ‘trust in God’. This came in a variety of ways. Some people just seemed to say it like it was a platitude, ‘trust in God; I’m sure it will be okay – I know someone who got pregnant and their M.E. went into permanent remission.’ (Mine didn’t; after an initial improvement I had a major relapse). Others actually prophesied healing by the end of the year, and although I wanted to be wise and weigh it up, it secretly gave me some hope. (I wasn’t healed). Others used ‘trust in God’ as a reason to justify their advice that I shouldn’t have a C-Section, and implied that if I did, I would be showing a lack of faith. Then I went to a ministry weekend away where people had pictures and words for me that were the same message: trust in God. These words I did take more notice of; they had no agenda to push, and it felt like God was telling us that. So even though I knew that most people with M.E. had a relapse 6-12 weeks after giving birth, even though I didn’t understand how pushing my baby could possibly not make me worse, I decided to go through labour. I decided to believe that it might be okay; I decided to trust God, I decided to hope. My labour was short (12 hours) and although painful, it was bearable. I had an epidural after 8 hours, which was a bit late, but it did help. But then my fears started to be realised. I ran out of strength to push after 5 minutes; I went on pushing for 1.5 hours. Eventually I had a forceps delivery. (One can never look at salad servers in quite the same way afterwards.) Shortly after giving birth my temperature and blood pressure dropped and I was barely conscious. I spent a week in hospital after the birth. It was fairly nightmarish. My heart went into tachycardia every time I sat up, and I was gasping for air. I couldn’t stand up or support myself, I had to be accompanied to the (en suite) toilet. I was in agonising pain, which I later discovered was caused by the bones in my spine being bruised by the birth. I couldn’t sit down. It was an effort to roll over. I couldn’t pick my baby up, dress him, change his nappy. My iron count was so low I had to have a blood transfusion. To make matters worse, most of the nurses and midwives didn’t understand M.E. or my pain. They seemed to think I was lazy or didn’t want to be with my baby. There were mutterings about social services and needing to make sure I was bonding with my baby and doing things for him before I would be allowed to leave the hospital. It was only when a midwife saw me transform in the space of five minutes from being propped up, eating a sandwich, talking intelligently to lying down, unable to speak or fully comprehend what she was saying that she understood that I really was ill.
What I actually said was, ‘my husband works from home’, as that’s the answer that seemed to pacify them. It was such a weird time, those first few months after the birth. I loved being a Mum; I felt so blessed to have my baby, and very much in love with him. Like most new parents we had the frightening and exhilarating and incredible time of getting to know our new baby and being new parents. But we were also having to simultaneously get used to my new level of disability. It was 3 weeks till I was well enough to change a nappy. It was 6 weeks before I was well enough to leave the house for an hour (in a wheelchair). We had to change our bedroom to the one nearest the toilet because I could only manage a few steps and it was too far for me to walk from the other one. I ate my meals upstairs because I couldn’t manage the stairs. I was almost entirely bedbound. Jon had to take a month off work, and for a few weeks after that he was taking our boy to his work meetings while I slept. And where was God in this? How did I process it spiritually? If I’m honest, I felt very, very angry. I felt in many ways like I’d been tricked; tricked by those Christians who had said it was going to be fine. I felt angry that I had believed them. Most of all, I felt tricked by God. When people were giving me the words, ‘trust in God’, I had heard, ‘trust in God, because your health is not going to be damaged by this.’ God had not promised that my health was not going to be damaged. He had not even promised that my baby was going to be healthy and okay. He had just told me to trust in Him. If we trust in God whilst unconsciously putting a condition on it, we are not trusting, we are bargaining. I had not trusted God, I had bargained with Him. I was angry with God that He had reneged on His side of the bargain; I had trusted, He had not healed. But God had not offered that to me, and I had no right to assume that that would be the case. Trusting in God does not equate to believing that God is going to give me the life that I want. That is wishful thinking, not trust. 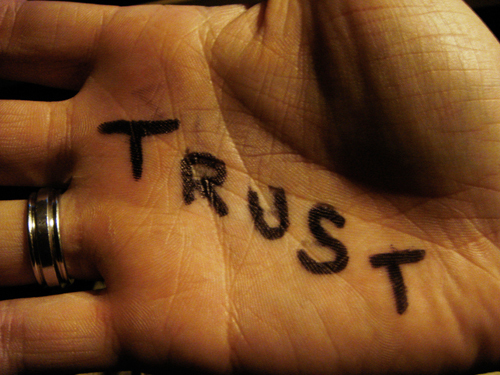 Trusting means looking to him, relying on him and his goodness, even when the situation is not as we hoped or wanted. Trusting means loving him and rejoicing in him, even when we don’t understand what he is doing. Trusting means hanging on when he is silent. It is one thing to say you trust God when you have plenty of figs on your tree, when your life is good, when you have plenty and security. It is another to trust in God when you lose your job, your money, your health, your family or your friends; when you cannot imagine how you are going to cope; when God takes rather than gives. Even though I still don’t really understand, I am learning what it means to trust. I do not rejoice in my illness and disability nor the uncertainty that it brings, but I am learning to trust in God, to rejoice in God my Saviour. I am walking in the valley of the shadow of death, but I am stretching out my hand in the darkness, hoping that God will take it. Have you ever been through a time in your life where God has taken rather than given? How did you process it spiritually? What do you think about the difference between ‘trusting’ and ‘bargaining’? I’ve got a few random thoughts buzzing around in my head, some of which I’ll try to get down and explain a little. First of all, as Mr Mcleod says in ‘The Man Without a Face’, “whatever else the past is, it’s gone”. I think he’s being a little defeatist in his approach, but there’s an element of truth in what he says. I’m guessing that God’s message wasn’t, “if you make the right decision, then you can trust in me”. Because that’s then you relying not just on God, but on yourself as well. Do you remember those books that we read as kids (I say ‘we’, but of course, if you didn’t, you won’t remember them)? The ones where you get to the end of the page and it says, ‘it you want to talk to the granny, turn to page 43, if you would rather talk to the man with the axe, turn to page 76’. So we turn to page 43 (who’d want to talk to the man with the axe?!) only to find that the granny kills us and the story abruptly ends (ok, so they weren’t perhaps that gruesome, but you get the drift). So then we turn on to page 76, and pretend that was our first choice (man, this comment is already rambling!). Well, sometimes I think like that in life, I think that if I make the wrong choice, it’ll be curtains, and God will be like “well, NOW you’ve screwed things up, haven’t you. You can’t seriously expect me to get you out of THAT mess”. And I think that if I turn to the wrong page, I’ll be sunk. But it’s not like that with God. Sure, Jonah had to get swallowed and puked up, but God didn’t give up on Him. Joseph was a bit cocky with sharing his annoying dreams, and got himself nearly killed and then sold by his brothers. But God didn’t give up on him either (sorry, those two examples are the wrong way around chronologically). God doesn’t have hidden clauses in the whole ‘Trust Me’ thing. [Don’t get me wrong, if we decide to turn AWAY from God as a permanent thing, that’s clearly a problem] God is faithful. Hugely faithful. As you say, Job was right to say, ‘though he slay me…’. Equally, Shadrach, Meshach and Abednego said something along the lines of, “Our God can save us from the burning fiery furnace, but even if he doesn’t, we still wouldn’t bow down to you.” Their trust wasn’t that God would do the right thing by them, but that He was completely trustworthy. So the message wouldn’t have been, ‘if you make the right choice about the C-section, then you’ll be in a position to trust Me’. Just, ‘Trust Me’. Of course, all that’s perhaps easier to say when you’ve not got so much ‘need’ to trust God. But God is trustworthy regardless of our needs. No needs we have will ever exceed His potential. No needs we have will ever exhaust His trustworthiness. The other main thing I’d say is perhaps dangerous ground. I’m not trying to say that sufferings rock and we should embrace them, even though there’s a danger of it sounding like that’s what I mean. But I think sometimes, when God takes away, we can also find something that he’s given. I don’t mean He took away Job’s sheep and then replaced them with more, but rather that, through His dealings with Job, Job was given something he otherwise wouldn’t have had. For me, I guess an example I could give (which, I know, is in many ways utterly different from your blog post, and therefore, feel free to shoot down the link) would be Joshua’s birth. He was born by emergency C-section, following a failed induction, and it was all a bit stressful. The bit before the birth was the easy bit though. I remember sitting on a stool in the operating theatre, thinking to myself that it didn’t seem right that one of the midwives, immediately following the delivery, was tapping the soles of his feet saying, ‘Come on baby’. Turns out he didn’t start breathing, and it was all very wrong. (Are you familiar with the APGAR test? He was 2 at both the first and second readings…). That night, after I’d left the hospital, phoned friends and was crying myself to sleep, I guess I had a taste of grief for the loss of a child, as that was, at the time, a very real possibility. (He’d been ambulanced up to London in a special neonatal ambulance). I think that’s given me a greater appreciation of God’s sacrifice. I can’t even properly describe the sensation, but it’s not great. I’ve got a perfectly healthy Big Boy now, but that night, maybe God gave me a sense of sorrow that I wouldn’t have otherwise had. An understanding that I’d otherwise lack. Don’t get me wrong, I’m not being sanctimonious or glib about it, and, a lot of the time, I think I’d rather be ignorant of that particular aspect of the crucifixion and its affect on the relationships in the Trinity. But there it is, God, in almost taking something away, gave me something else in return. Now, please don’t think I’m saying we should all just spend our time cheerily looking for the silver linings in life. I don’t want to belittle any experience or pain or grief or suffering. It’s just that, sometimes (on a good day perhaps?) I wonder if maybe God ‘taking away’ isn’t the only perspective to my experience. Wow – this is worthy of a whole post in its own right! I LOVE your analogy about those books with the alternative endings! (I used to love those books as a kid…) Yes, if it’s about making the right decision with little or no guidance, then it makes God into a cruel quiz master and it becomes all-dependent on our decisions rather than God’s will. (Although you put it very much better than that). Your example of Shadrach et al is a very helpful one. I think that’s where I arrived at; God CAN heal, but even if he doesn’t, we trust him because he is trustworthy. “God is trustworthy regardless of our needs” – yes. (Or at least – yes, that is what I believe). I’m pondering what you say about God giving something when he takes away. I think you could be right, but it’s a tricky one to get into. If you were given the choice between having to go through that traumatic experience and gaining an insight on the cross, or not going through it and not having the insight, there’s a chance that you might actually choose to go through it. But if it were a choice of gaining an even greater insight into what it feels to losing a baby by not having Joshua at all…? I think part of the problem is that sometimes the ‘gains’ of what we learn through suffering (and there are significant gains, I agree) don’t really seem to make up for those losses. In a way I would like to say there is an equation where the more God asks you to suffer, the more you will gain spiritually and therefore it all comes out okay in the end, but I just don’t think that’s true. I think the Bible allows us to say that suffering is crumby and won’t be answered in this world – it’s not like a karma-balance thing. (Although as I write that I remember that Rom 5 says we rejoice in our sufferings because of their effects, and that Paul says that he rejoices in his weaknesses and sufferings. Hmmm.) I think that may be the limit of my profound response to this! WOW, I bet this blog was a little painful!! Thanks for sharing it. I can’t imagine what it was like to have suffered the prejudice of the hospital staff, on top of everything else. I will always evaluate my ‘trust in God’ and make sure I’m not bargaining from now on!! Sadly this type of thing is happening more and more and it’s not right and it scares me. I don’t know why God is silent/passive when His word says He is the opposite. We’re meant to take His word as fact and believe what it says… it speaks of everything good for us… that He will never abandon us, that He blesses the righteous, etc. It’s full of that all the way through pretty much. My question is, that is unanswerable, I know, but still I will voice it – why is He letting His children that are reaching out to Him in faith and living by His word and trying to do all the right things…suffer? We have nothing but Him, He is our everything and yet sometimes it seems He turns a blind eye? It’s so scary…. He says He is like a father to us… yet so many times I hear stories of situations His children are in, that if an earthly father knew about it, he would move mountains to intervene… .yet God seems to remain at a distance and just ignore their cries? I know people who believe God doesn’t love them and favors others above them….because though they’ve cried out to him for over 20 years in illness, bedridden, He has seemingly done nothing at all. It’s heartbreaking… it really is…. because it is so inconsistent with God’s character it seems. I don’t understand. For me, I too am sick of ‘pat christian’ answers about this as in the end we take God at His word and His Word is not void. It’s meant to be so much more…and He’s meant to back it up and be all it says He is….otherwise what is the point of having it? I know He is still God and can do what He wants… but if we are to be His children, it would great to see Him helping us like a father would I guess (as that’s how He wants us to see Him isn’t it?). I know we have limited understanding and I mean no disrespect in what I’m saying, just frustration about your situation and many others I know of… that’s all. I guess we will understand some day?? Thanks so much for this comment. I know what you mean about not understanding why God allows people to go through suffering, and that seeming incompatible with his character as a loving Father. I also feel frustration and powerlessness when I look at others’ situations (sometimes that’s even harder than dealing with something yourself). I don’t want to resort to pat Christian answers myself, but the only thing I would want to say is that although there is a lot in the Bible about God wanting good for us and not abandoning us and blessing the righteous, there is also a lot in there about God being silent. Job is a huge one for this (though it all ends very happily!) God abandons Jesus on the cross (Jesus is separated from God the Father – I believe this is because he bears our sin and God is pouring out his wrath at our sin). So, although I don’t really completely understand why it feels like God abandons us, I do know that Jesus also felt that way when he was at his lowest. Sometimes that helps, sometimes it doesn’t. One book that has been brilliantly helpful to me is ‘God on Mute’ by Pete Greig. It is written by someone whose ministry is centred on the 24/7 prayer movement which has seeen countless miraculous instances of healing – and yet his wife has not been healed of debilitating epilepsy. It is a brilliant, pastorally gentle, theologically deep, Biblically faithful book about the search to reconcile that tension – I can thoroughly recommend it. Brilliant post Tanya – such great insights. I do think though that there is a danger in simply trusting God, in the ‘throwing your hands in the air and not taking responsibility type way’. I’m not saying you do that here – but this is a two way relationship – God is trusting in US to make the right decision (however right is defined), to use the skills he has given us to think things through, and to take responsibility for our actions. That doesn’t mean not trusting in God ofcourse. But it does mean understanding our role in the course of our lives. Hi – thanks so much for you comments – nice to see you on here! Yes – trusting God does not exclude decision-making and taking responsiblity for those decisions. I think I felt that a lot with the C-section vs labour question, especially the people telling me that trusting God = not having a C-section. Jon points out that it was very much my decision to go for labour rather than C-section; we were eventually given a completely free choice by the doctors and not pushed into anything. Love this post, totally resonates, I remember the first time I realised that trusting God wouldn’t always mean that I was safe, secure and comfortable, or rather more scary that those I love wouldn’t always be safe, secure and pain free. It brings a whole new depth to working out what on earth we are trusting God for… and hints that he might be up to something more significant that a pain free life. Strangely I feel this way with my new job, it’s hard and most of the time I don’t like it and majorly want out (best hope my boss doesn’t read your blog eh). Sorry, overly long comment a go go. Anyways. Much food for thought! Thanks so much for this, Kath. That’s so funny – I totally expected that your new job would be great and fun, just because it sounds sorta Christian. Isn’t it weird the expectations that we have of other people? These issues are hard. In my head, when I’m holding court with God in the dock, I can argue both for prosecution and defence. Of course, a relationship with God is more significant than our comfort. But when does our discomfort slide into the levels of suffering? And why does God want us to suffer? These are not questions that I ask about suffering so much as questions that I feel in times of suffering. It’s a well known verse, its used a lot and we bandy it about when we see anyone suffering and say “Hey, it’s for your own good” in a rather trite fashion. We say to each other and to ourselves that this illness, this situation, this disability, this depressive mind, is God working his purpose out for my good, and that somehow I’ll be better off because of it. I cling to those words and imagine that somehow when I suffer, God is doing a little bit of refining – and once it’s done he’ll polish me up again and set me back on the course that I think I should be taking. But you are so right – we bargain with God – but more than that – we somehow think we know better than God. Why do I suffer? Lot’s of people will give lots of answers to that, there are the generic ones – “Because Christ suffered first”, “Because of sin”, “Because God is teaching you something” – this last one is one that I can really get attached to, but I know that whilst it may be true in some situations (remembering that I don’t want to limit what God can and cannot do) I’m not sure the Bible tells us that we’ll have a hard time (persecution being different) to learn things. I think we have to look back at the Romans passage and see that in all things (good and bad, pleasant and unpleasant) God is working for the good of those who love him. So when God says ‘Trust Me’ we are to trust him – as you say unconditional trust – not to do something but to trust him and his promises. He has said he will do things, and he will. It kind of reminds me of those films where two sides are against each other, and someone from the good side says to his friends and cohorts “Remember, whatever may appear, whatever you see or hear, whatever it looks like I’m doing – trust me” and then appears later in the film to have switched sides and be working against his friends, doing them harm, and many of his friends decide he’s a bad egg, a traitor and turn their back on him and try to kill him. Only later in the movie do we find out that he’s been working to bring down the enemy from within and has been totally faithful and loyal to his friends. He has done what he said he would – been trustworthy – nothing more than that, nothing less than that. I wonder too whether we need to look at those words in Romans and fell more universal about it, it’s not going to help you, and will probably feel trite but…. Is it possible that you suffer, that you go through all this – not necessarily for the good of you, but others who love Him? For others who have been called according to his purpose. You say “People had said to me, ‘why do you expect God to give you the worst case scenario? What kind of God do you believe in?’ – and here I was, in my worst case scenario. In fact, it was worse than my worst case scenario.” Yes it was worse than your worst case scenario – but I still wonder whether it is right to EXPECT God to give us the worst case scenario? BUT I also don’t think we should EXPECT God to give us the best case scenario (remember this is coming from someone who generally expects the worst) rather we should expect God to be God, to keep his promises, to do the things he has said he will. To be faithful, unchanging, trustworthy, good, powerful, majestic, sovereign, loving, compassionate, merciful, righteous, just, holy, pure, loving and that he will grant us sufficient grace. Your blog is becoming a really useful and helpful thought tool, it helps me to think through things but also to correct myself where I have foolish thoughts – but it’s also challenging. I’m aware that we talk sometimes when we all meet up – and that its both usually after wine and unprepared. That means that as you go back through past events I can hear my own words and worry about them having been unhelpful or worse damaging. Sorry. Wow. As ever, your comments are really rich and in-depth, and help me continue my thinking on these issues. – films with the ‘trust me’ goody. Yes, I had half been thinking of a Spooks episode where that happens! That’s a really helpful illustration to help process what God might be doing in times when we don’t understand what he’s doing. – re Romans 8:28 I’ve NEVER considered that interpretation of that verse before as God working good for the whole community rather than the individual who’s undergoing the suffering, but that is a really interesting suggestion. It makes a lot of sense, and is a useful corrective to our individualised thinking about faith. I shall ponder it. – is it right to EXPECT GOd to give us the worst case scenario? I think you are right in this as well; that even if God does end up giving us the ‘worst case scenario’ it would be faithless to go around expecting that of Him. We shouldn’t be trying to second-guess God or doubting his goodness. Conversely, we shouldn’t expect God to give us the best-case scenario, as though somehow we’re entitled to it. Where does that leave us? Not sure! Not knowing what to expect, I guess! Maybe trusting in God’s character rather than any particular outcome; I think that’s what I was trying to express in the post. Brilliant (not the M.E. bit!) – but the understanding of Trust. You are right – Trusting in God doesn’t mean everything will be as WE want it to be. It means putting our Trust in a God who is all knowing – who see’s the bigger picture and knows where we are going.